No, not a radical environmental group sounding the call this time around. It is the United Nations – Environment Programme with the recent release of the report: UNEP Global Environmental Outlook: Environment for Development (GEO-4). This report assesses the state of the planet since 1987, and was drafted by over 390 experts in the field of environmental studies. It was just released Thursday, October 25, 2007. Sadly, the outlook on the world’s water is dire. The report warns that a combination of rises in global population, unsustainable agricultural practices, increased degradation of water quality, and climate change will decrease water availability worldwide. Two billion people could face water scarcity by 2025. 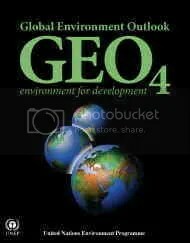 To order a paperback copy of the report, see Earthprint.com or download a copy for free on-line at this UNEP web-page.